If running bamboo were going to take over the world, it would have done so thousands of years ago. There are running species (temperate cold hardy, Leptomorph) of bamboo which we love and there are clumping (Pachymorph) species. These species are commonly defined by their rooting (rhizome) characteristics. For simplicity sake, there are two major types of rhizome developments. There are many other aspects such as long neck versus short neck pachymorph and even hybrids root structures but we will keep it simple. Clumping bamboo displays pachymorph or sympodial components to their rhizome structure. Meaning that each rhizome turns upward to form a culm. Running bamboo exhibit leptomorph or monopodial rhizomes. This is characterized by an independent underground stem from which aerial culms develop. We dislike the clumping species and specialize in cold hardy runners. We currently grow 152 different species of which around twenty are clumping species. 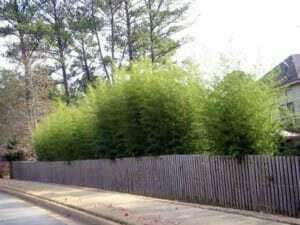 The clumping bamboo has never impressed us with their looks or growth rate. We did have some nice Bambusa multiplex varieties that reached 8 to 12 feet in height just under a decade. For many years they were top killed each winter, but finally gained the root structure to remain evergreen, until it died completely in a cold 2008 winter. 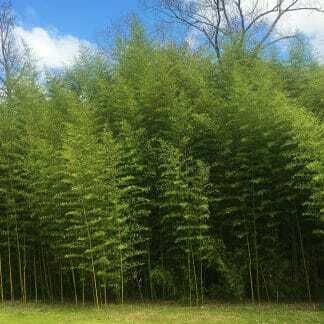 Which one will provide the best bamboo screening? Running bamboo can provide a serene privacy screen or a beautiful bamboo grove to walk through. Runners with easy maintenance can make a dense natural screen very effective in urban landscapes to provide privacy. They form very vertical privacy screens providing dense screening even in a narrow planting site. 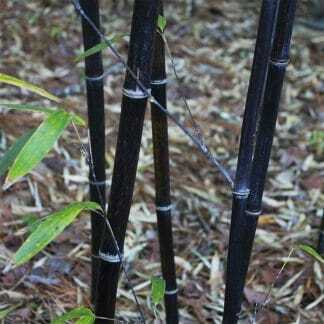 Clumpers for screening purposes leave a lot to be desired as they are narrow at the base and weep over at the tops leaving huge gaps between each bamboo plantings. To the right are photos of clumping bamboo planted in zone 8 during the early 1950’s. There is a running species for most all climate zones. From the cold of climate Zone 5 to the warmth of the tropics, there is a running species suited for all applications. Clumpers are very limited to the areas they can grow, even though there are cold hard and tropical varieties of clumping bamboo. The cold hardy clumping species ( mostly mountain bamboo) are very limited in the climate zones they can live in. They take years to reach 8 to 12 feet in mature heights. In climate zones 7 and warmer, clumping species struggle to survive and usually die due to the summer heat and humidity. In colder climates, they will do fine if you desire a slow growing bamboo that matures at 8 to 12 feet in height. For screening purposes they leave a lot to desire as they are narrow at the base and weep over at the tops leaving huge gaps between each bamboo plantings. Tropical clumpers can only be grown in very warm climate zones such as zone 8 and 9. 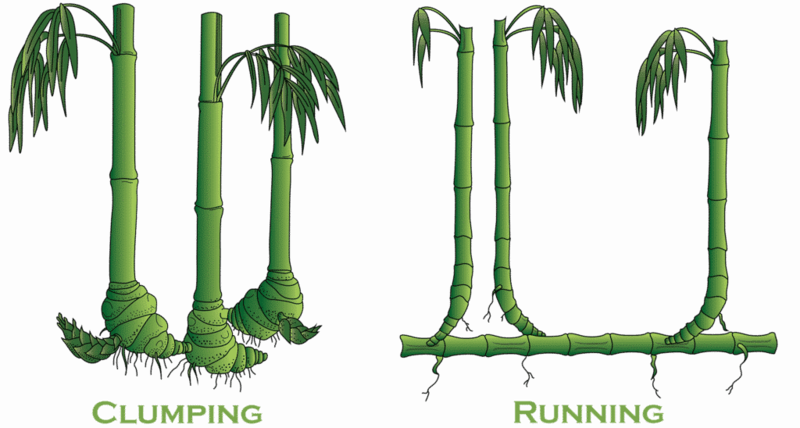 The tropical clumpers are giants and can grow very fast like running bamboo. The problem is the limited climate zones and the spacing of the canes within the clumper. The spaces between the culms (canes) are so close most specimens are very unsightly due to the large amount of dead canes and limbs in the interior of the clump. These dense dead canes and limbs cannot be reached unless some of the outside canes are cut away first. The tropical clumpers I have seen in my travels have been poorly maintained and are unsightly giving bamboo a bad image. Even a well kept botanical garden such as Fairchild Botanical Gardens in Miami, FL which we visited in 2003 for a bamboo meeting, had thousands of unsightly dead canes in their clumping bamboo. A grove of running bamboo is unparalleled in my book and we have seen thousands of groves over the past 50 plus years. Control of running bamboo is simple and there are numerous methods which we have listed on our web site. Mowing your lawn as always along with root pruning twice a year around the desired grove perimeter are the most common methods. 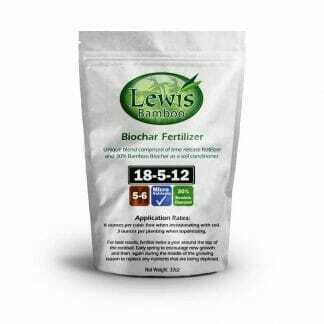 There is also the in ground barrier containment method. Control of clumping bamboo is almost impossible. It is not as aggressive, but is forceful about where it wants to grow. 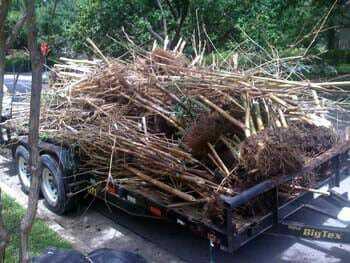 In ground root barriers have a harder time controlling clumping bamboo. Because of the higher force exerted, we recommend our thickest variety of Bamboo Shield, 100 mil x 36″. 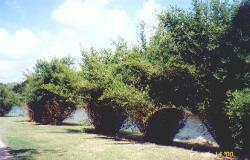 It is not possible to root prune a clumping species to control it. Running bamboo follow the path of least resistance and change directions when they become impeded. Clumpers are persistent and will force their way through obstacles in their outwardly spiraling root path. 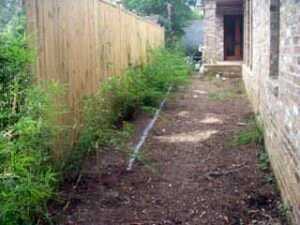 Never plant a clumping species right next to a foundation or concrete driveway. The picture to the left clumping bamboo that was removed. It tends to grow tight at the bottom and expand at the top. 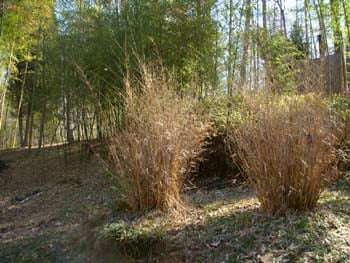 The new growth occurs on the perimeter of the plant causing a fluming effect, leaving dead and older canes in the middle. Due to space constraints, this was an unwise choice for this application. It was removed and replaced with Phyllostachys Nigra Henon. A beautiful running bamboo that can be easily controlled with barrier. 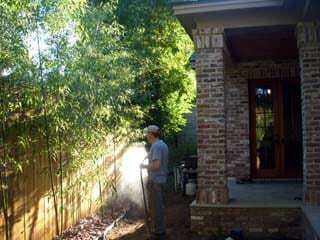 Here, we are watering the bamboo after the job was completed. The bamboo is installed and worry free. This will provide a excellent privacy screen and will add another element of beauty to this amazing home. We ship premium bamboo right to your door! Always Fast & Free Shipping, No Minimum!